The Boeing 787 Dreamliner is an American lang-haul, mid-size widebouk, twin-ingine jet airliner made bi Boeing Commercial Airplanes. ↑ "Boeing 787: Orders and Deliveries (updated monthly)". The Boeing Company. November 30, 2017. Retrieved December 11, 2017. ↑ Gates, Dominic (September 24, 2011). 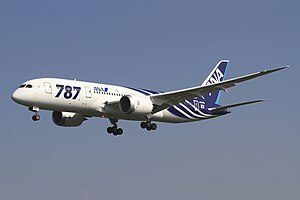 "Boeing celebrates 787 delivery as program's costs top $32 billion". The Seattle Times. Retrieved September 26, 2011. ↑ 3.0 3.1 3.2 "Boeing: About Boeing Commercial Airplanes - Prices". Boeing. Retrieved December 4, 2017. This page wis last eeditit on 11 Dizember 2017, at 14:35.